Mine tailings are often disposed of in slurry dumps. Older facilities of this kind may include relating dams that have been poorly designed and constructed. This can pose a threat to local residents and the environment. Progressive oxidation can result in the dissolution of metals. This may impose an increased pollution burden on the aquifers. The stability and design of these structures is also very important. Impoundments of this kind, depending on the particle size distribution of the stored material and the degree of moisture penetration, can become transformed into a completely fluid state when poorly constructed, even when the activation energy is relatively low. This can cause damage by breaching of the dam wall over a wide area. Tailings excavation can therefore be a necessary measure in order to address environmental and safety issues in the long term. Such an excavation operation may even be justifiable for economic reasons. Many of these tailings impoundments were filled several decades ago and by today’s standards contain considerable quantities of raw materials in comparatively high concentrations. There are many reasons for the upsurge in economic interest being shown in old waste dumps, including the development of new mineral processing techniques, a change in the price structure of the main valuable metals, a growing interest in accessory minerals and secondary mineralisation actions at certain horizons due to processes taking place within the body of the impoundment. With all these aspects in mind the Freiberg Mining Academy and other partners carried out investigations into a Chilean tailings impoundment as part of a scientific Secondary Mining Project (SecMinStratEl). The installation in question has been assessed as lacking long-term stability, according to Chile’s current structural standards. One aim of the project was to investigate a cost-effective option for the excavation of the tailings material with possible selective recovery of the enrichment zones. The Secondary Mining Project (SecMinStratEl) “recovery of strategic elements from disused mining waste dumps (e. g. tailings impoundments) at selected locations in Chile, combined with a more environmentally compatible storage of the residue materials” is a cooperation project with Chile that is aimed at assessing the raw-material content and yield potential of a flotation tailings impoundment and subsequently investigating the options for productive recovery (1). One of the impoundments in question lies at the western foothills of the Andes mountains. The site covers an area of about 188 ha and contains some 50 mt of sediment (2). The entire region is prone to seismic activity, as the Nazca Plate subducts beneath the South American Plate (3). Fig. 1. Schematic diagram of the south dam (2). // Bild 1. Prinzipskizze des südlichen Damms (2). Work on the tailings impoundment newly commenced in 1929 after the retaining dam of the other tailings impoundment was broken as a result of dynamic stress (4). The dam of the new tailings impoundment was initially constructed using the downstream method and the installation was then continuously filled with tailings until 1936 (Figure 1). By this time the dam had reached a height of 56 m. After this the impoundment was only used as an emergency deposing facility until the 1950s. Because of this occasional usage a second dam had to be built in the northern part of the installation in 1959. In 1966 both dams were then raised in height again by a further 7 m, this time using the upstream method, whereby it was found that the upper part of the impoundment had become much more unstable (2). In recent years the Chilean Government and its various administrative departments have continued to apply more rigorous nature conservation and environmental protection measures and these increasingly stringent safety regulations have meant that since the 1980s the tailings impoundment has been the subject of regular site surveys and inspections. The dams themselves were strengthened in some sections in order to enhance their structural stability. Following a further tightening of the regulations the main dam was deemed to be lacking in long-term integrity. This problem mainly concerned the top 10 m of the structure that had been built up after 1960 using the upstream technique. This area was assessed as being in a particularly critical state (2). An initial characterisation of the tailings impoundment was made by sinking five boreholes into the solid rock beneath. Geoelectrical measurements oriented towards the boreholes were also taken in order to determine the water content. The material contents of the samples obtained from the holes were examined using X-ray fluorescence (XRF) analysis and the solubility of the copper was then examined by way of eluate production with water or ammonium nitrate. Fig. 2. Copper and molybdenum content of a borehole sample obtained from the western part of the tailings impoundment – measurement data from a cali-brated handheld XRF analyser (5). // Bild 2. Beispielhafte Kupfer- und Molybdängehalte einer Bohrung im westlichen Bereich des Tailings – Messdaten mittels kalibriertem Hand-RFA-Gerät (5). The copper levels were in the region of 0.04 to > 0.6 %, with the high concentrations being found mainly in the southern part of the site. Equally striking was the fact that different concentration levels were found at different depths (Figure 2). This is the result of different processing cycles and the oxidation of some minerals. Lower concentrations were found at the boundaries of each of the three filling phases, as the copper minerals oxidised and therefore became more soluble. They then penetrated deeper into the impoundment, where they became enriched. Much elevated copper concentrations with good solubility occur in these zones, where the layer thicknesses are not so pronounced (5). The very different molybdenum concentrations can be attributed to a number of distinct processes. The most noticeable of these is the sudden increase at a depth of 10 m and more. It is therefore likely that a sustention of the molybdenum minerals only took place after the year 1960. Moreover, in the underlying beds the molybdenum content suddenly falls below the measuring limit, which would indicate low mobility. This assumption has been confirmed by Ussath et al (6). Fig. 3. Views of the tailings impoundment as generated by the MineSight planning tool (2). // Bild 3. Verschiedene Ansichten der Spülhalde mit MineSight erstellt (2). The shape of the impoundment was determined very effectively using geoelectrics, this work being undertaken by the project partner Federal Institute for Geosciences and Natural Resources (BGR) (Figure 3). The seat rock has a very pronounced dip of as much as 70 m to the west, while in the east the slope of the ground, as measured, is much shallower (7). The surface of the impoundment is subjected to inflows of water from various directions. The surface water in the northern and central zones is channelled to the west via a drainage system and is then fed into the surrounding streams and rivers. In the southern sector the surface water runs into an exploratory trench and is then allowed to seep into the tip itself. The outflow of this seepage water then runs towards the southern dam causing a gradual ingress of water into it (7). The exploratory trenches also revealed that the upper 10 m of the impoundment were not water-logged. Complete water saturation was only deemed to exist at the deeper levels, where lower strength factors could be expected (2). Preliminary investigations indicated that the upper 10 m of the impoundment had a stability rating of around 100 kN/m2. However, in the water-logged areas this figure falls to about 60 kN/m2. But with a relatively low drainage effort it should be possible to sustain an embankment height of about 7.5 m at a slope of 35°. could be deployed for the excavation work, as other types of extraction technology would not be a realistic option (8). The suitability of the three aforementioned systems were examined in some detail in (5). 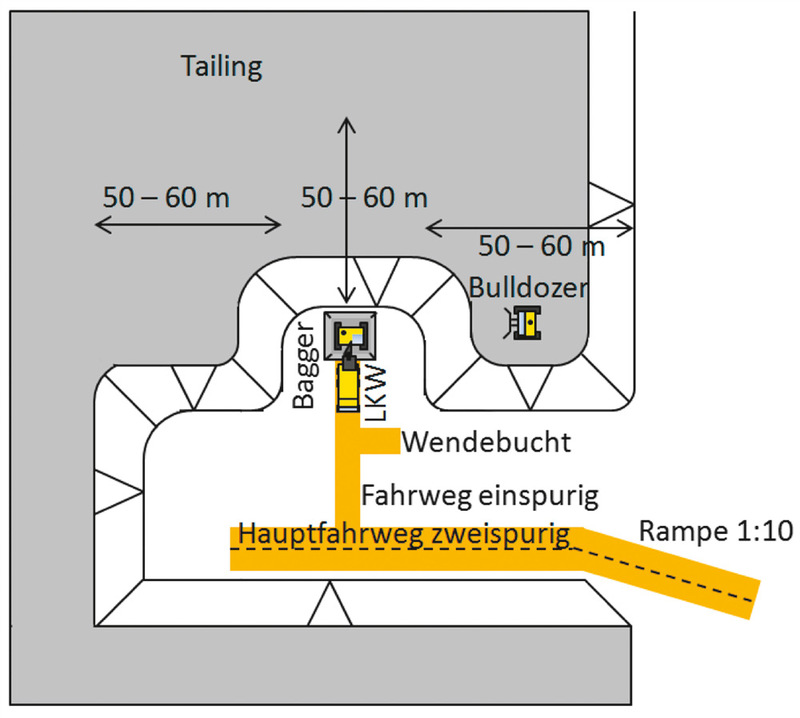 Freiberg Mining Academy collaborated with TAKRAF, headquartered in Leipzig/Germany, to investigate the exploitation of a strategy to use a compact-class bucket-chain excavator that would be suitable for the reclamation of the tailings impoundment in question (Figure 4). Fig. 4. ERs 500 bucket-chain excavator (9). // Bild 4. Eimerkettenbagger ERs 500 (9). The planning phase focused on several potential mechanical systems. The one presented here is the preferred option because of its lower belt-conveyor costs and reduced machine downtimes. 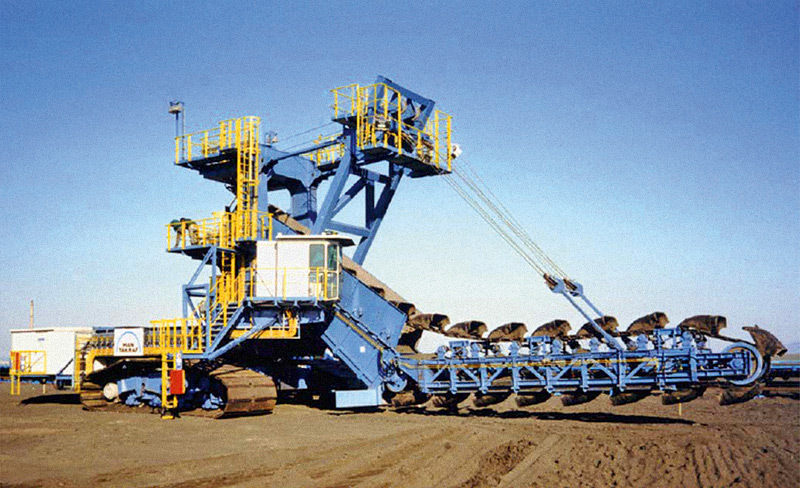 A mobile transfer conveyor is also used to further reduce the downtime factor. Another positive aspect is that all the belt conveyors are in operation throughout the entire project duration. This requires, however, that haulage trucks are employed in the northern sector only in order to undertake some localised excavation work, though only in areas where the surface has a load-bearing capacity of > 100 kN/m2. Some 1.5 m m3 of material have to be recovered using mobile vehicles. This part of the site is to be excavated last and as such will no longer have any effect on the stability of the dam. 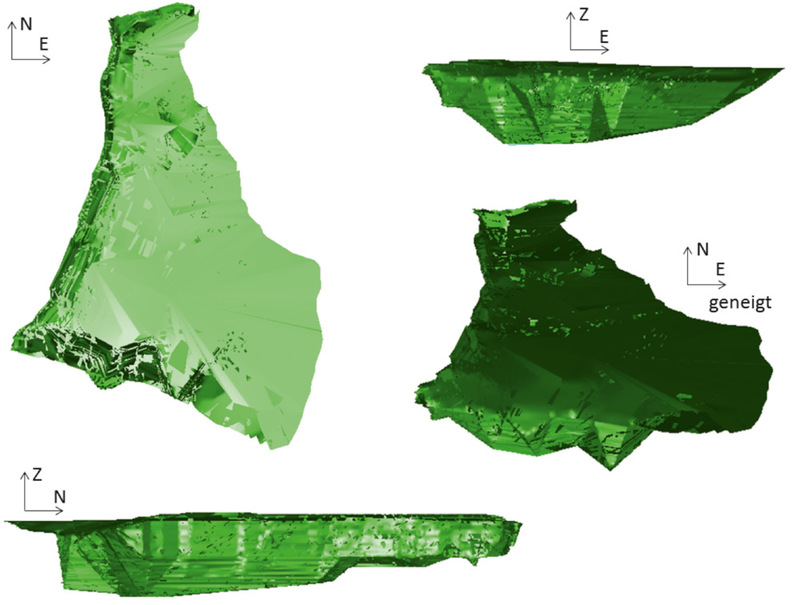 Because of the zonal division of the site the individual section cuts are to be adapted to the thicknesses of the increased mineral concentration. Those sections that are located entirely within low concentration zones are to be excavated by frontal attack. Areas containing higher mineral concentrations will then be extracted as selectively as possible using deep cuts in combination with block operation. The material will be stored in a bunker located to the east of the impoundment. The areas containing low mineral concentrations will also be excavated and the material transported by belt conveyor to the south-eastern sector of the site (Figure 5). A hydraulic conveying system will be used to take the material to the new porperly sealed and stable spoil dump for storage. This solution will help minimise transport costs, as it means that the existing infrastructure can continue to be used. Fig. 5. Conveyor arrangement (2). // Bild 5. Bandschema (2). In the preliminary study the proposed use of dumper trucks did not include any road construction measures. In the course of subsequent planning, however, it emerged that the pond sediments did not have sufficient load-bearing strength. This meant that the proposed arrangements for truck-based excavation had to be adapted accordingly (Figure 6). Fig. 6. Detail drawing of the baseline status of the dump-truck exca-vation process with a bulldozer operating as an auxiliary machine (2). // Bild 6. Detailskizze des Ausgangszustands der Mobilgewinnung mit Bulldozer als Hilfsgerät (2). A twin-track main roadway is now being laid in the southern sector of the site alongside dam number 2. Single-track roads will lead off at right angles from this main haulage roadway at intervals of 100 to 120 m. A bulldozer with suitably low ground contact pressure will push the material towards a hydraulic excavator positioned on a raised gravel platform. The excavator can then load the material on to a dumper truck. As soon as one block has been completely excavated the haulage road can be extended and the process will begin all over again. The advantage of this system is that several blocks can be excavated even when they are at different layer depths. This results in a uniform delivery of mineral-rich and mineral-poor material. Fig. 7. Hydro-monitor for spoil reclamation (10). // Bild 7. Hydromonitor zur Gewinnung einer Spülhalde (10). Hydraulic excavation (Figure 7) was another potential solution adopted from previous planning strategies. This technique involves preparing a series of individual flumes so that the covered material can pass along these channels to a centrally located pump tank that separates out all the larger-sized material that is not part of the treatment sludge. A pipeline then transports the slurry to the eastern part of the site. A sedimentation process can be used to reclaim some of the water for the hydro-monitoring operation. The sludge mix is finally transported via another pipeline to the treatment plant. The problem with this particular method is that it requires large quantities of water and at the same time results in the loss of practically all the readily soluble copper. Setting up a processing facility with copper recovery is therefore not a practical proposition, which is why the material is discharged directly on to the new spoil dump. 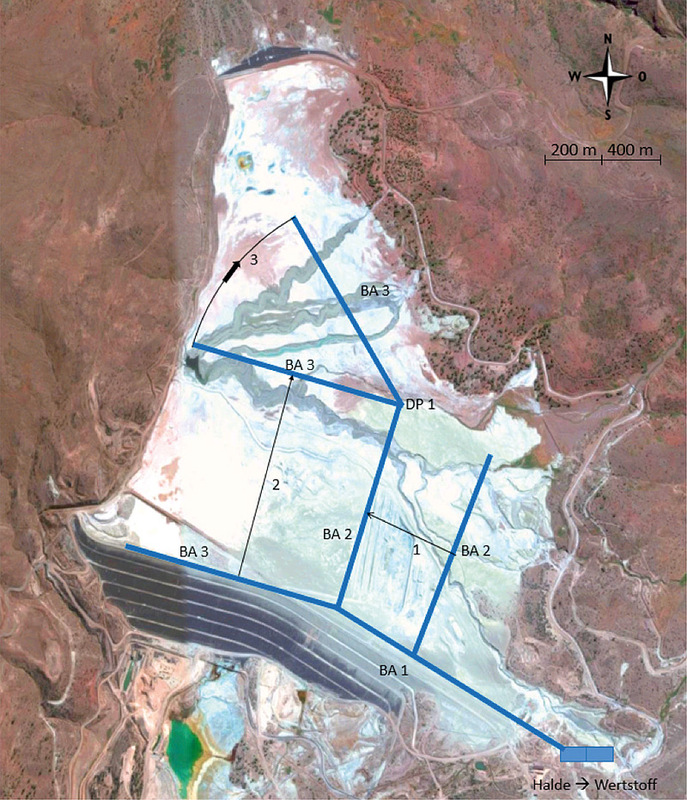 The available data were used to develop a model of the ore-rich areas present in the Chilean tailings impoundment. Because of lack of detailed geochemical data the main focus at the current time is on the technical feasibility of the different excavation methods and their capacity to adapt to different operating scenarios. For this reason the investigation sought to develop two different solutions, namely a heavy equipment system based on a compact bucket-chain excavator of modular construction and a dump-truck excavation system. These two options were then compared with extraction technologies examined in previous studies. Heavy machinery solutions may be considered as an interesting alternative for the selective excavation of mine tailings. One of the main advantages of heavy equipment technology is its durability if properly serviced and maintained. Even though the investment costs seem high at first glance, machinery of this kind can be used for various operations beyond the initial 40-year lifetime. Their modular design makes for easy assembly and dismantling, which means that the installation can be transported to any site that can be accessed by heavy duty vehicle. The economic deployment of heavy machinery of this kind mainly depends on the existing layer thickness, the target-material concentration and the mineral losses to be expected in combination with water. Mobile excavation by dump truck can only be regarded as a good technical solution for spoil tailings that are small in area and have a very stable surface, as otherwise their disadvantages outweigh their plus points. 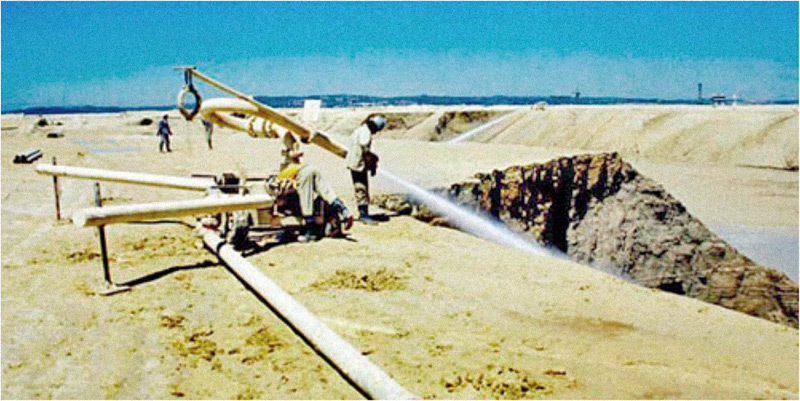 Hydraulic excavation is the most cost-effective technology for extracting mine tailings. The main problems with this system are its poor selectivity and the risk of solubility, resulting in the loss of valuable mineral material. The target-material content of the tailings and its processing potential is therefore the key factor in deciding whether the most cost-effective solution for this particular project is to use hydraulic excavation technology or a modular type of compact-class heavy machinery. However, this requires a good knowledge of the make-up and substructures of the tailings impoundment. Then it will be possible to identify and selectively extract the rich-ore horizons. (1) Hoth, N.: Projektsteckbrief – „Secondary Mining – Gewinnung strategischer Elemente aus Bergbaualtablagerungen (z. B. Tailings) ausgewählter chilenischer Standorte, verknüpft mit einer anschließenden umweltschonenderen Verwahrung der Restmaterialien“ (31.07.2017); SecMinStratEl (2017). (2) Krichler, T.: Selektive Gewinnung chilenischer Tailingsmateri-alien – Konzept zum Einsatz von Großgerätetechnologie im Vergleich zu anderen Verfahren. Diplomarbeit, Freiberg 2016. (3) Liste von Erdbeben in Chile, https://de.wikipedia.org/wiki/Liste_von_Erdbeben_in_Chile, 31.07.2017. (5) Krichler, T.: Hydrogeochemische Charakterisierung von im Tiefbau gewonnenen und verkippten Materialien. Studienarbeit, Freiberg 2015. (6) Ussath, M.: Mobility of Strategic Elements in Chilean Tailings in the Context of Secondary Mining Processes. Freiberg 2015. (7) Nikonov, W.: Interner Arbeitsbericht zu geophysikalischen Untersuchungen einer chilenischen Spülsandhalde. BGR, Hannover 2015. (8) Kühn, G.: Der maschinelle Erdbau, 1. Auflage, B. G. Teubner Stuttgart 1984, ISBN 3-519-05233-4. (9) Abbildung eines Eimerkettenbaggers ERs 500, http://www.takraf.tenova.com/product/bucket-chain-excavators/#bucket-chain-excavator-ers-500-in-bulgaria, (30.07.2017). (10) Hydraulic mining of tailings, http://www.tailings.info/technical/hydraulic.htm, 09.08.2017.